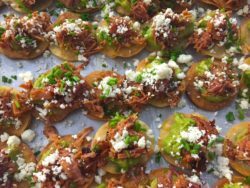 Mini Chipotle Pulled Pork Tostadas | Recipe For A Party | Life is a Party, So Celebrate! This recipe works best if you want to have Chipotle Pulled Pork for a second day to be made into sliders, sandwiches or burritos. 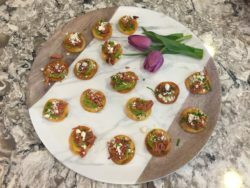 Since this recipe is for a small appetizer you will have plenty of pulled pork for something else. I love recipes that can be used for multiple meals; you end up hitting two birds with one stone, so to say. My post for “Cuban Sliders with Chipotle Pulled Pork”, you can see the posting link below in the ingredients list, is my recipe for the pulled pork I used for this recipe of Chipotle Pulled Pork Tostadas. 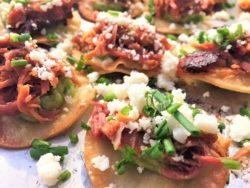 OMG it turned out so good, you can eat 4 or more of these mini tostadas, I’ve seen many party guests do so. This one or two bite wonder is like a taco party in your mouth, and what’s wrong with that? Don’t just dream of Mexican food, it can be a reality, so make this for your next party! Heat about a 1 inch amount of oil in a medium sized frying pan over medium high heat, fry mini tortilla rounds turning once until they are golden brown, place on paper towel lined sheet pan after each batch and set aside. 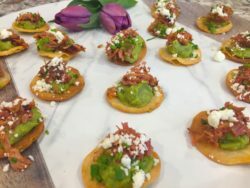 Line a sheet pan with the fried tortilla rounds and top each one with teaspoon of guacamole followed by a tablespoon or so of pulled pork, topped with a bit of crumbled cheese and sprinkled with chives on top. 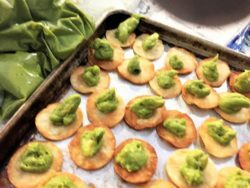 Makes 35 mini tostadas, enough for a party of 6 to 8 as an appetizer.